“Chahlie” at 73, still getting high. Guy is a second generation arborist. His dad was well known in New England for providing arboricultural work at some of New England’s most prestigious properties, including Harvard University and some of the famous mansions in Newport, Rhode Island over his 35 year career. Guy began his career working with his dad in Massachusetts, and he also worked as a disease and insect treatment technician for a large New England tree service. His duties there included applying experimental Dutch Elm Disease treatments. The application method for those treatments was the forerunner to the technique now used for oak wilt treatments. 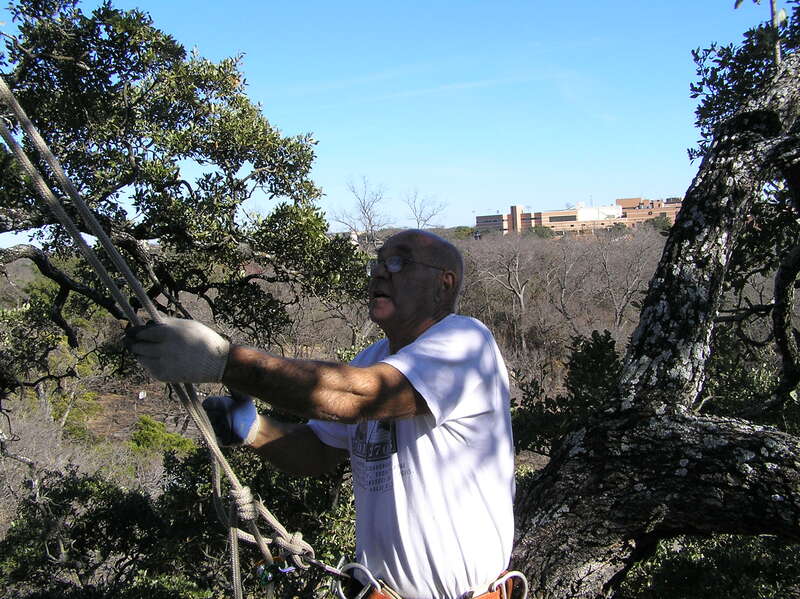 Guy has performed tree care in Austin for over 35 years. He registered Arbor Vitae Tree Care in 1983, and has been the sole operator ever since. He is proud to have worked on many of Austin’s best known public properties and private estates, including the Treaty Oak, the Umlauf Sculpture Gardens, the Lady Bird Johnson Wildflower Center, Mayfield Park Cottage Garden, the old Federal Courthouse, Pease Mansion, the Inshallah estate (in Hyde Park), and more. Most clients are residential. Also during this time Guy has performed extensive work on multiple visits to historic estates in Hawaii and Europe. During his three decades in the tree care business, Guy has attended hundreds of workshops, lectures and conferences, many taught by the absolute top researchers and practitioners of arboriculture. For the last dozen years, Guy has himself been an instructor for both professionals and laypersons. For initial consultation call 301-8700.